Pumpkin again! 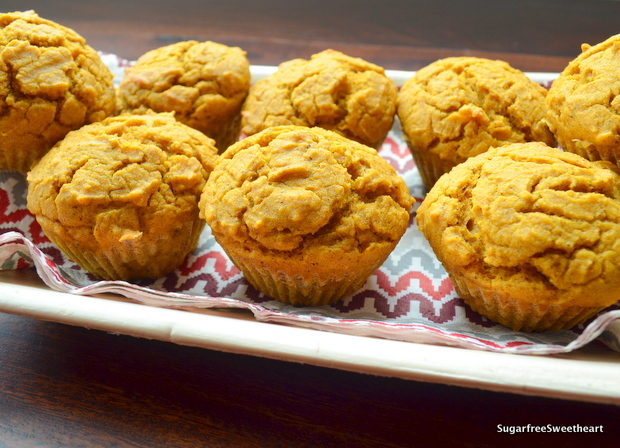 These pumpkin wholewheat muffins are great for making in advance because unlike the Pumpkin Pie in the previous post, these muffins taste pretty great straight out of the refrigerator, even the next day! This is a really simple recipe and if you’ve got some unsweetened canned pumpkin puree you could whip these up quite quickly. This recipe is suitable for diabetics, weight watchers, and pumpkin patrons! The perks of fiddling around with the vanilla bean and extracting the seeds yourself include a rich vanilla aroma in your dessert and a gentle vanilla scent on your fingers! I used less Sugarfree Natura Powder than a usual batch of muffins to account for the sweetness of the pumpkin puree and also allow the pumpkin flavour to come through. Add sugar-free dark chocolate chips (or little pieces of sugar-free dark chocolate) to the batter for some pumpkin-chocolate magic! This looks awesome! I’m always looking for healthier muffin recipes and I cant wait to try this! This looks like a great recipe – and the muffins are such a wonderful colour. Thanks for sharing. Thanks Georgina! Have been checking our your blog.. love your writing style! 🙂 Thanks for stopping by here! These muffins look divine – perfect for the fall season! Whole grain, has pumpkin and flax meal… and of course low sugar… wow Priya.. Awesome job. Im making this, now just hope my girl likes this.